Autosport Designs Racing (ASDR) announced late last week that the team will be contesting all ten rounds of the 2006 SCCA SPEED World Challenge GT series, with two Aston Martin Racing DBRS9s – to be driven by Tom Papadopoulos and Johnny Mowlem. “We are delighted to be involved with Aston Martin’s return to GT racing in the United States, with two SCCA World Challenge specification DBRS9s,” said Chief Engineer Barry Wagner. The team’s statement is rather ‘light’ on hard information, but Johnny Mowlem was able to fill in the gaps. “Autosport Designs is the largest vintage Aston Martin, Porsche and Ferrari dealership in North America, and Tom Papadopoulos, one of the co-owners, has been racing such cars for many years. He and his partner have set up ASDR to run the first Aston Martin DBRS9s in America. “I was in New York before Christmas for a meeting, and through our mutual friend Andrew Marriott, I called in to their workshop, just to have look around before I flew back to London . Tom and I hit it off straight away, and initially they just asked me if I'd be able to help them out with some testing. Then Tom and I ended up meeting again at Prodrive earlier this month, and one thing led to another and now I'm racing it instead! Both cars will obviously be Prodrive built cars and both they and Aston Martin Racing will be looking for the car to develop speed and reliability as the season progresses. I'm delighted to be able to race an Aston Martin, with all the heritage that goes with that, and I'm looking forward to battling with some top drivers in the series, as I know from watching it last year that it is an extremely competitve and cut and thrust championship." "The only other racing plan that I can confirm at the moment is that I'll be back with ACEMCO for their 2006 Le Mans assault. I'm really pleased about that, because I know how well they got the Saleen running last year, and I also know how much more work they are putting in place to make the car even faster, so with some luck on our side for a change we'll definitely have a shot at the GT1 victory. I love Le Mans and I aways seem to go well there, which made missing it last year quite difficult, so it's a real pleasure to be going back with such a competitive package. Last time I drove for Jeff there we were leading in his Ferrari by two laps before an engine failure, so let's hope we can lead the last lap this time!" 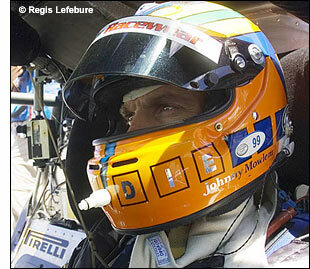 Apparently Johnny Mowlem has yet another racing plan that is being announced soon, at the Rolex Daytona weekend. A busy year for Mowlem? He's off to Florida on Wednesday, to race the SAMAX Porsche in the Rolex 24.